Protect your Side Sills and Rear Fascia! As many of you SRT-10 owners know, it only takes a handful of miles to chip up the front of your side sills and rear fascia... and by the time you do 3 or 4 oil changes, you are lucky to have any paint left at all! Stop it DEAD in its tracks! 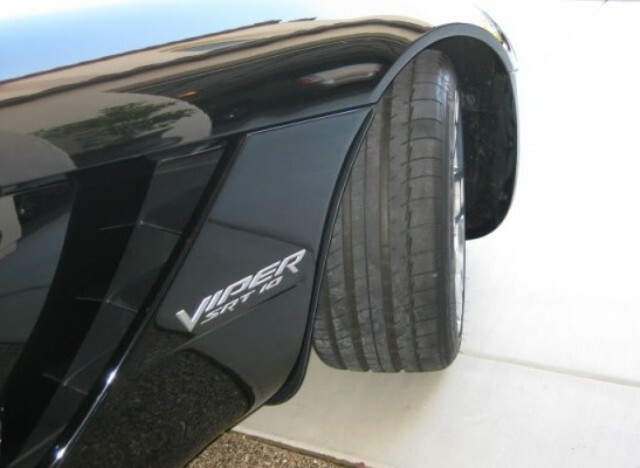 These guards cover from the top edge of the side sill all the way down to the lower splash shield, and back behind the tire, both front and rear. These stone guards are CNC machined, and use all of the same fasteners your car came with. They are made from a semi-gloss rubberized plastic, and will not crack or deteriorate over time. Simply take out your three front sill screws, the three lower splash shield pins, and put these in its place for the front. For the Rear, simply take out your two rear fascia-to-shield screws, and drill/pin the bottom section with the supplied two lower plastic push-pins. Note: The inner black plastic splash shield is drilled- NOT any painted surface. This is a readily available wear item. Packages Include (2) Front Sill Protectors, (2) Fascia Protectors, (2) Spacers, and (4) Pins. Select below if you would like to include 6 new push-pins for the front with your order.